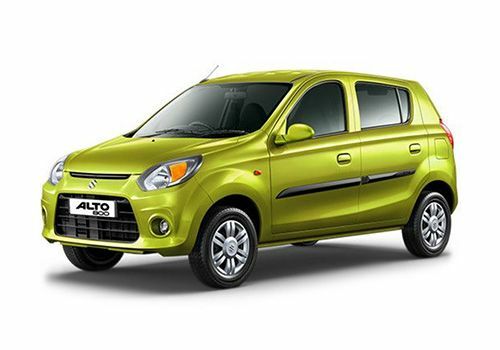 Maruti Alto 800 LXI Airbag is a mid range petrol trim in its model series. It comes equipped with a 0.8-litre petrol power plant that is paired with a 5-speed manual transmission gear box. This is a 3-cylinder mill, which displaces 796cc. This variant is incorporated with a reliable braking and suspension system that helps in its smooth handling. In terms of safety, it is loaded with aspects such as a collapsible steering column, engine immobilizer, high mount stop lamp and a few others that ensure a safe drive. This hatchback comes with a unique wave front design that is quite eye catching. Furthermore, the expressive lines as well as stylish aspects add to its appealing look. Its frontage looks quite decent with petal shaped headlamps and a bold radiator grille, while the rear end includes body colored bumper and an expressive boot lid. Coming to its spacious internal section, there are well cushioned seats incorporated, which offer enhanced support. Also, there are sun visors, cabin lights and a few utility based features offered. Other aspects like power steering wheel, can holder, front power windows and some others provide good comfort to its occupants. Besides these, it comes fitted with a large fuel tank that can hold about 35 litres of petrol in it. Considered as one of the best small cars in the country's market, this hatch comes with a wave front design that makes it look quite unique from others. Its sloping window lines as well as the swaying roof further adds to its appearance. To describe its front fascia, it has a pretty wide windshield that is integrated with a couple of intermittent wipers and a washer as well. The bonnet looks attractive with some visible character lines, whereas the bold radiator grille is accentuated with chrome and embossed with company's insignia in its center. It is surrounded by a radiant headlight cluster featuring petal shaped headlamps. Then, the bumper is painted in body color and fitted with a large air intake section. Moving to its side profile, it has body colored door handles and outside rear view mirror on the right side. The wheel arches are equipped with a set of 12 inch steel wheels that come with full wheel covers. The radial tubeless tyres of size 145/80 R12 adorns these rims and offer an excellent grip on all roads. On the other hand, its rear end has a bumper, tailgate with company’s emblem and a windshield. A couple of bright tail lamps on either sides further adds style to its rear end. The cabin with a dual tone Grey and Brown color scheme looks quite attractive. It provides comfortable seating for five people besides offering them with sufficient leg as well as head space. It is incorporated with well cushioned seats that are covered with high quality fabric upholstery. The dashboard is well designed and equipped with a three spoke steering wheel. Other aspects like a glove box, silver garnished instrument cluster, and a center console are also equipped to the dashboard. Some of its features like door handles, and steering wheel are plated with silver, whereas the door trims with fabric inserts further add to its interior appearance. A few other aspects in the cabin include floor console, three cabin lights, floor carpet, and speedometer are also available. This hatchback is powered by a 0.8-litre, F8D petrol engine that comes with a total displacement capacity of 796cc. This mill is compliant with Bharat Stage IV standard emission norms. It comes with three cylinders that are further fitted with twelve valves. It is integrated with a multi point fuel injection system that aids in returning a decent mileage. On bigger roads, it can give a fuel economy of around 22.74 Kmpl, which comes down to nearly 17 Kmpl, when driven under city traffic conditions. Besides these, it is mated with a cable type, five speed manual transmission gear box. This propels the vehicle in achieving a top speed of around 140 to 145 Kmph and it also helps in breaking the speed mark of 100 Kmph in 15 to 16 seconds approximately. This motor has the ability to churn out a peak power of 47.3bhp at 6000rpm and delivers maximum torque output of 69Nm at 3500rpm. It is incorporated with a reliable braking system wherein, its front wheels are fitted with solid disc brakes, whereas the rear ones are equipped with sturdy drum brakes. As far as its suspension system is concerned, it is quite proficient and helps it in maintaining stability at all times. The front axle has a McPherson strut with torsion roll control device, whereas the rear one gets a three link rigid axle and isolated trailing arm. Both these axles are further loaded with coil springs and gas filled shock absorbers. Moreover, it is offered with a power assisted steering system that makes driving easier in any road conditions. I n terms of comfort, it is packed with a few aspects that help in giving a pleasurable driving experience to its passengers. It has coin holder, 1-litre bottle holder, remote fuel lid opener, front door trim map pockets, and a dual tripmeter. The cabin is installed with an air conditioning unit that comes along with a heater. There are sun visors available at front, while the front windows are power operated. Other than these, it also includes can holder, assist grips, driver side storage space, power steering, digital clock, passenger side utility pocket, dial type climate control as well as remote back door opener for added convenience. The car maker has loaded it with some vital aspects that provide high level of security to the vehicle and its passengers as well. It has a rigid body made of high strength steel, which reduces and protects from impacts in the event of a collision. The engine immobilizer is helpful is avoiding any unauthorized entry into the vehicle. In addition to these, the list further includes a collapsible steering column, head light leveling device as well as high mount stop lamp for added protection. 1. It offers ample cabin space. 2. Fuel economy is rather good. 1. It lacks music system.